I couldn’t resist heading back to Africa this week. And not only that, I’m taking a brief break from the really early material I’ve been posting and moving ahead to the 1960s for this release. And why not? South Africa (as well as other countries, such as India) kept pressing 78s up until the late 60s, at least. There were a slew of local labels churning out hundreds of fantastic jive singles throughout that decade – labels like Troubadour, Tempo, Stokvel, Tee Vee, F.M., Gallo New Sound, and Winner, which is where this nice jive track comes from. The pressings were great, too. A mint copy sounds like a mint copy with little to no surface noise. For you folks who prefer the older stuff, give this a try! 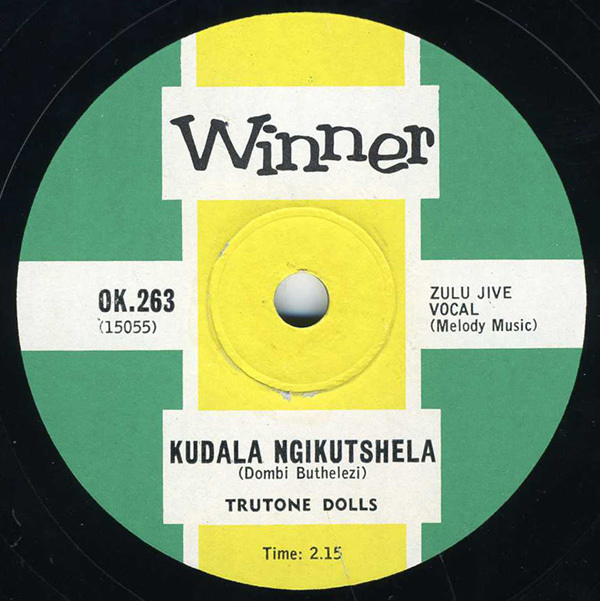 I have no idea what happened to the Trutone Dolls, although I have another great record by the group on the Stokvel label. It’s titled “Jo Jo In School.” If any of you out there are familiar with the late-60s, South African jive compilation on Mercury Records titled “Ice Cream and Suckers,” you might remember that title track’s melody. The Dolls used that same backing track for their “Jo Jo” song. It was written by Strike Vilakazi and I guess he tended to reuse backing tracks for other artists as he saw fit! very nice Jonathan – so hard to date these – I have winners as late as OK 369 (and even a kid ma wrong wrong with cat # OK 500 although I suspect from the matrix # it was issued earlier). Do you have any idea on how to date them?